Enjoy the comfort, warmth and coziness with this Disney Micky Mouse Jersey Stripe Twin Blanket year round. Perfect for around the house or while traveling. Children are sure to love cuddling up with their favorite characters. Perfect for any Mickey Mouse fan! 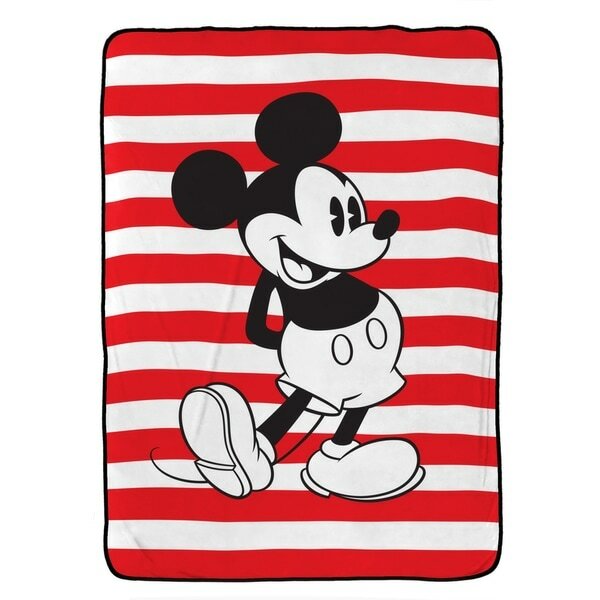 Blanket features the lovable Disney star, Mickey Mouse with nautical red and white stripe print . Makes the perfect gift. Blanket measures 62" x 90". Easy care, machine washable polyester. Imported. I gave this to a friend for Christmas who is a huge fan of Mickey. The blanket is a nice size and it's a good quality. I'm hoping she enjoys for many years to come! This oversized throw is perfect for my grandchildren’s Disneyland playroom. I put it over futon to use for nap time.